After graduating from Rockledge High School in Rockledge, FL, a city in central Brevard County, Romann Chavannes, co-owner of 321 Kiteboarding and Watersports, followed in his father's footsteps and joined the United States Air Force. 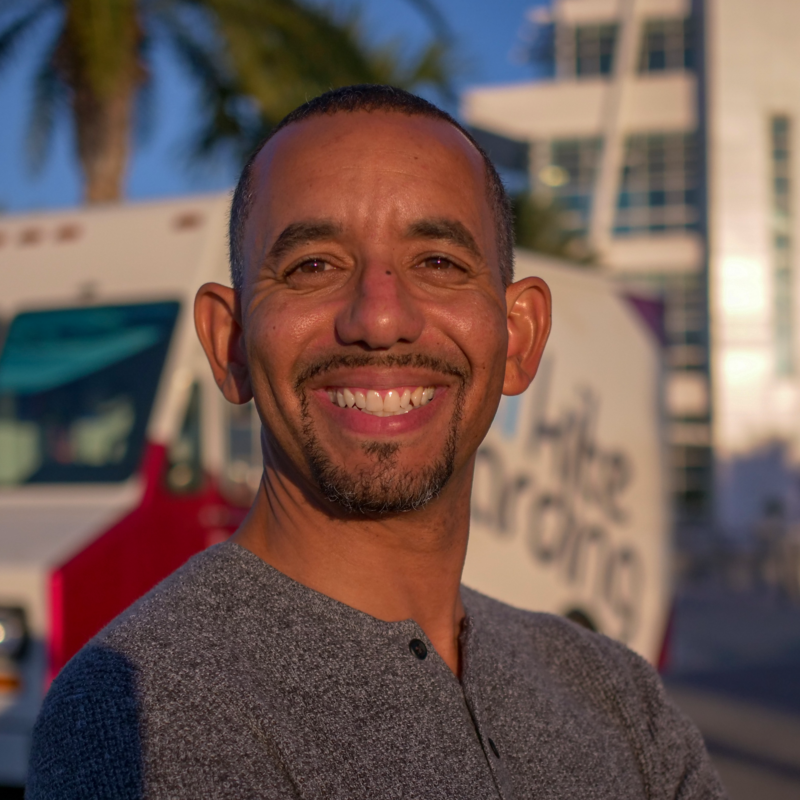 Wanting to travel and experience the world, Chavannes spent six years in the military before finding a fit in the auto industry and eventually, an even better fit as an entrepreneur. "When I first got out of the Air Force, I worked for a printing company in Minnesota," he said. "It was here where I was introduced to the owner of a Ford dealership and first got into car sales. When I moved back to Florida, I continued to work in that industry. I sold cars, managed staff and started new programs for Jaguar/Land Rover and Lincoln Mercury. I did well and I really enjoyed it, but everything changed when I discovered kiteboarding in 2006." After seeing someone kiteboard for the first time, Chavannes was hooked. He taught himself how to do it and gradually fell in love with the sport. In 2007, he met Brett Zachar, the original founder of 321 Kiteboarding and Watersports. The two formed a friendship and Chavannes' love of kiteboarding grew even stronger. In 2008, Zachar started a kite school business based out of his van. A year later, he moved into an actual brick and mortar location. In October of 2009, Zachar and Chavannes teamed up to bring their love of kiteboarding to watersports enthusiasts throughout Central Florida and beyond. "I was still with Jaguar/Land Rover when Brett first approached me," Chavannes said. "He would ask me about different business ideas and before long, we were collaborating on things. He asked if I knew someone interested in working in the shop and I said, 'Yeah, me!'. Partnering with Brett required me to sell my car, downsize my house and make other sacrifices, but I was really excited about the opportunity." Chavannes described the process of building the business as, "Building an airplane while it's flying". Early challenges included getting their name out there and courting kiteboard manufacturers, while focusing on lessons and maintaining a solid local reputation. "We basically called all the manufacturers and told them we were hot stuff," Chavannes said. "We focused on brands that were highly sought after. We managed to convince a few to sell exclusively to us. That's not unheard of in this industry, but a lot of brands are scared to limit themselves. We did a lot of events where manufactures were able to come and showcase their products. Ultimately, we built a community of like-minded individuals and got them to rally around what we were doing." Chavannes shared that what he loves most about running 321 Kiteboarding and Watersports is the fact that he doesn't even consider it a job. He truly enjoys everything about the business. On a community level, he enjoys spreading his joy for the sport he fell in love with 12 years ago. Seeing the passion ignited in those new to the sport is what keeps Chavannes teaching lessons a few times per month. Looking ahead, Chavannes is focused on growing the business into something that's franchise-able. According to Chavannes, no one in the industry has plans to do multiple stores. They want to be the first. To that end, Chavannes and Zachar have spent the last year and half developing written policies, procedures and systems for everything they do. They'll focus on opening two or three more stores, as proofs of concept, before officially going down the route of franchising. Chavannes shared some lessons learned and advice for aspiring entrepreneurs. "I've learned that you always need money," he said with a laugh. "I've also learned that exceptional customer service, as cliche as it is, can overcome a lot of objections. Our solution, from the start, was to custom tailor everything for our customers and provide a level of follow-up similar to what they'd expect with a high-end experience. When it comes to advice, I like to tell people to throw your norms of how you're supposed to look or what you're supposed to be doing out the window. It doesn't matter what you're doing or how much money you're making. What's important is that you're doing something you're passionate about. From the standpoint of actually running a business, everything is scary. It's never easy to make decisions that have consequences for people other than yourself. Nevertheless, when you're passionate, you can deal with anything that comes along by replacing your fears with your zest for life and your passion."